Edinburgh-based LendingCrowd said it secured an external funding round of £2 million following a strong 2017 for the peer-to-peer (P2P) lender, with the proceeds earmarked for ramping up its sales and marketing activities. The round was led by angel syndicate Equity Gap and included a number of prominent private investors from Scotland’s entrepreneurial and finance scene and the Scottish Investment Bank. “The company is on track to scale significantly during 2018 and intends to seek series A funding over the next 12 months,” said LendingCrowd. 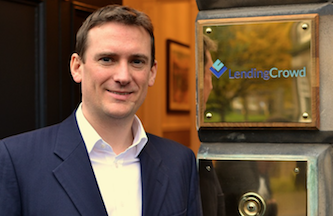 LendingCrowd, the only P2P lending platform headquartered in Scotland, is targeting a “game-changing year” following a 12-month period in which loan deals totalling £16 million were agreed with SMEs across Britain. On the back of a record start to the year, CEO and co-founder Stuart Lunn has set a target to more than double loan deals in 2018 to around £40 million. New clients in 2017 included Pickering’s Gi producer Summerhall Distillery, restaurant chain Tony Macaroni and property lettings agency Umega Lettings. Investor funds on the platform have grown rapidly, with much of the expansion attributed to the launch of one of the first Innovative Finance ISA (IFISA) products in February 2017. After a full 12 months of opening the LendingCrowd Growth ISA, 82% of investors have beaten the advertised 6% target return. LendingCrowd, which is authorised by the Financial Conduct Authority, has more than 4,500 investors signed up to its platform and is on track to significantly increase investor numbers this year. It now offers three IFISA products – the passive Growth ISA and Income ISA, and the active Self-Select ISA. Stuart Lunn, LendingCrowd CEO and co-founder, said: “Having laid solid foundations for the business over the last couple of years, we now have a position in the market that is starting to pay dividends. Jock Millican from Equity Gap said: “We are extremely pleased that our syndicate members once again backed LendingCrowd, with this raise being the largest single investment by Equity Gap to date.